In terms of technological advancement, motorcycle brakes have been accelerating for quite some time now. However, many people still have no clue how motorcycle brakes actually work. With the HEL brake lines and other components that go into the braking system, it can all be very intimidating for people who have just purchased their first motorcycle. The technology for motorcycle braking systems has been evolving rapidly, and it’s seeing new mounting systems, larger pistons and even greater power assistance. Over the last few years, manufacturers have been producing motorcycles that seem to be getting smaller and smaller. The fact that motorcycles are being produced with less mass means less work for braking systems. It should be quite obvious that the main purpose of brake systems is to bring a motorcycle to a complete stop. However, it gets much more specific than that; a brake system is supposed to convert kinetic energy into heat. For people who don’t know about kinetic energy is, it’s the energy that is created by the speed of a moving object. Motorcycle brakes slow a motorcycle down at a rate that is linked to how fast the brake system converts kinetic energy into heat. A brake system that can convert kinetic energy very rapidly will slow down an object much more quickly. However, since kinetic energy increases in direct proportion to the square of a motorcycle’s speed, the job of the brakes becomes much more demanding. For example, a motorcycle travelling at 80km/h will have four times more kinetic energy than a motorcycle travelling at 40km/h. Motorcycle brake lines make it possible for a rider to activate the braking system. The majority of motorcycle braking systems use a cable system. In some very rare situations, a motorcycle might use a hydraulic braking system, the way that motorcycle brakes work is almost exactly the same way that car brakes work; the difference is in the way that the brake systems operate. Car brakes use all four wheel brakes at the same time. With motorcycle brakes, the front and back brakes normally operate independent of each other. Sometimes a motorcycle has a braking system where a foot pedal controls the rear brake while a hand lever controls the front brake. 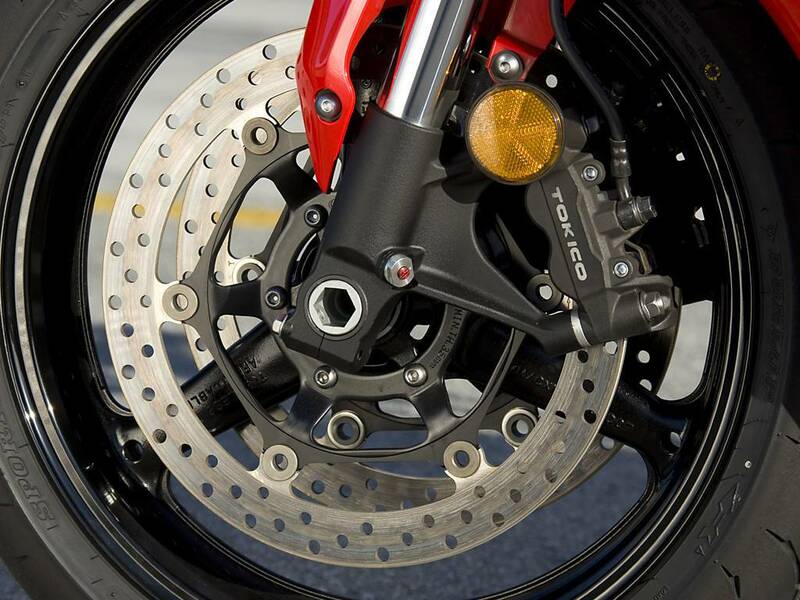 The majority of the stopping power comes from the front brake on a motorcycle brake system. Organic and ceramic brake pads are normally used for motorcycle brake systems. These are the same materials that are used for brakes on car or truck. Due to the smaller size and weight of a motorcycle, organic brake pads will last much longer on a motorcycle than on a car or truck. Many people would think that motorcycle brakes must do all of the work. However, this is simply not true; while riding a motorcycle, wind resistance is always present. Wind resistance increases as a motorcycle accelerates faster and faster. Wind blasts the brake pads and reduces their temperature, so wind resistance helps brake pads transfer some of the kinetic energy that they have converted to heat. It’s important to understand that brake pads are only slightly cooled by wind resistance. With all of the information considered, motorcycle brake systems are only different from car and truck brake systems in the way that they operate. This article was provided by LHSS the specialist manufacturers of silicone hoses.